Green Fields Nursery School true to it's name is a home away from home where an imaginative & colourful ambience is provided to nurture the carefree young saplings till they blossom. 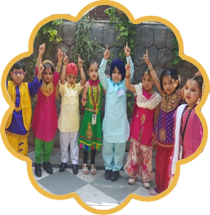 An all round education is imparted in a fun filled environment where teaching and learning are carried out in an interactive manner in an atmosphere of love and care. The children are exposed to a wide spectrum of experiences bringing about amazing changes in them while broadening their horizon and developing their intellect. 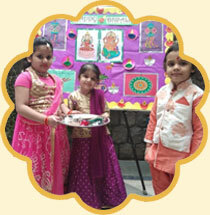 Value based ecucation plays a pivotal role in education at GFNS wherein social, moral and spiritual values are taught keeping in mind India's rich cultural heritage and traditions. Please click on the images to view each album. We have shown a lot of good quality snaps from our events which take a few moment to download. A fun filled and an eventful year comes to an end. As we draw curtains on the session 2018-19, we take great pride in looking at our confident kids ready to take their flight into the world of formal education, with skills that we lovingly nurtured in them over the two years they have been with us. Each child has bloomed into a flower. 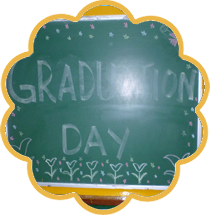 The culmination of this session will be befittingly celebrated through the “Graduation Day”, was held on 16th March 2019, at Green Fields School, A2 block. The young graduates will be awarded their certificates as they step into primary school. 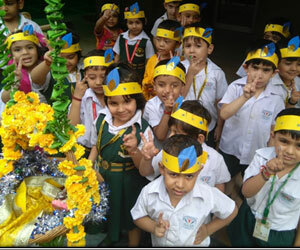 With the onset of Spring season, children from nursery and prep classes celebrated Basant Panchami with enthusiasm. 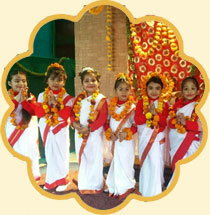 They seeked the blessings of Goddess Saraswati through a dance performance. Children from Nursery and Prep classes visited The Fire Station and Post Office as part of the Kinesthetic learning practiced in school. Live demonstration of the fire drill and learning about the post office and its working were thoroughly enjoyed by the children. 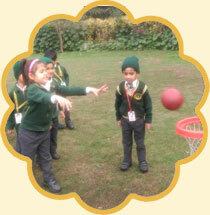 Nursery class went for an excursion to enjoy a fun filled day playing organised games. They also went for a nature walk to appreciate the flora and fauna around us. 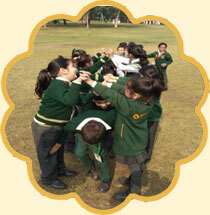 Prep class went for a picnic to Nehru park where they thoroughly enjoy games and activities outdoors. A rotuine health check up was carried out for all the children of the nursery school where height, weight and other parameters were checked out by the school medical professionals. To give children hands on exposure to day to day activities, activity based learning is encouraged. Children were shown properties and examples of fire, water and air. 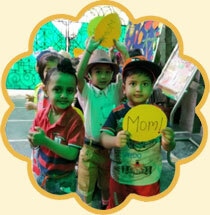 Children also made a collage on various seasons. To promote a healthy lifestyle and encourage sports amongst children, a cycle race was conducted for nursery class children. The mini cyclists thoroughly enjoyed pedaling with their friends. The 70th Republic day was celebrated on the 25th January. The event was celebrated through a special assembly where the teacher spoke about the significance of the national festival. A colourful programme sowed the seeds for patriotism in the future citizens of our country. 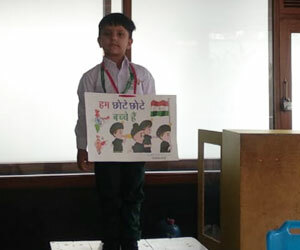 The children were advised to watch the grand Republic day parade, held at Rajpath on TV and share their experinces with their classmates and their teachers. As a part of Republic day various activites like kite making, flag colouring etc were held. 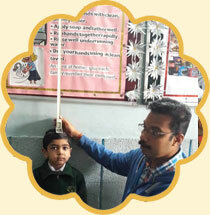 The Martyr’s day was observed on 30th January at the school. The children were told about the importance of the day. The staff and the children observed silence for 2 minutes at 11 AM to show respect to the Martyrs who laid down their lives for the country and to show reverence to the Father of the nation. The children of the Preparatory learned the types of houses through an innovatiove activity by making a hut from paper cups. This activity was throughly enjoyed by them. To promote gross motor development and to instill sportsmanship in children, a lemon and spoon race was held. 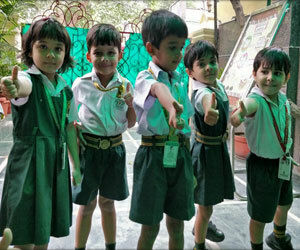 ‘Umang’, the annual day celebration of Green Fields Nursery School was held on 15th December. 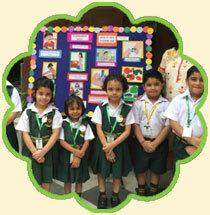 Children from all the Prep and Nursery classes showcased their talent and enthralled the parents and audience. Chief Guest, Shri Narendra Chawla, Mayor, South Delhi Municipal Corporation, was highly appreciative of the performances put up by the tiny tots and also commended the teachers and staff for their relentless efforts. To inculcate the spirit of participation and all-round development, children from Prep class had an inter class Drawing competition. 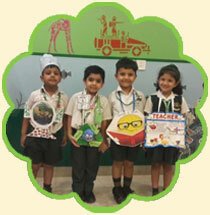 Keeping in mind the theme of the month, Prep class children also had a Show and Tell Competition. 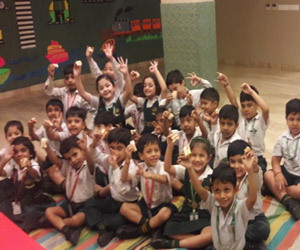 Children from nursery participated in an English recitation competition that helped improve their communication skills and boosted their self-confidence. 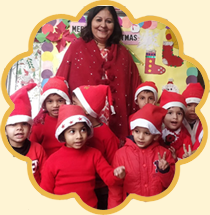 Christmas, the festival of hope, joy and sharing happiness, was celebrated in the school premises. The story of the birth of Christ was enacted by children of Prep class. Children’s favourite Santa Claus made an appearance and danced with them. Children made craft takeaways of Santa and X-mas tree. They were also told the significance of the New Year and made New Year greeting cards for their parents. 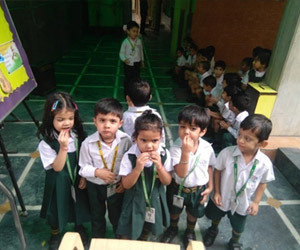 To encourage children to play and inculcate healthy competitive spirit, lemon and spoon race was organized for nursery class children. 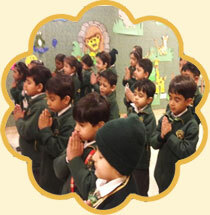 The festival of lights was celebrated with utmost pomp and joy in the school. A special assembly was organized to educate children about the significance of the most awaited festival of the year. Children were advised to celebrate Diwali in an eco friendly way. 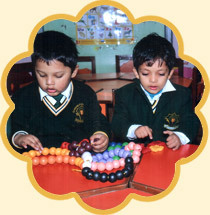 Various art and craft activities were planned and children enthusiastically decorated their respective classes with their crafts. The birth anniversary of Pt.Jawaharlal Nehru was celebrated with many programmes conducted by teachers. 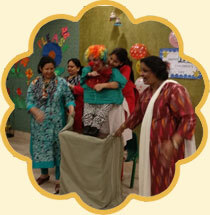 The programme included skits, dances, storytelling, puppet shows and a magic show. 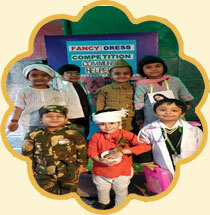 The Fancy Dress Competition was organized for Nursery. The children enthusiastically turned up dressed as community helpers. The birth of the Sikh Guru was marked in a sombre manner. Teachers narrated various stories of the Sikh Guru. 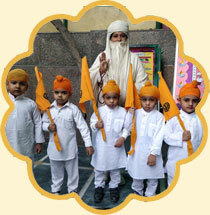 The occasion saw the “Prabhat Pheri” by the children who were dressed as the “Panch Pyare”. 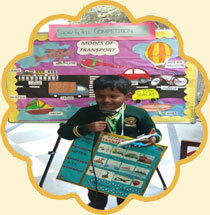 The confidence of the Preparatory children was put to test in the Show and Tell Competition on the topic “Transport”. The confidence and the vocabulory left everyone spell bound. 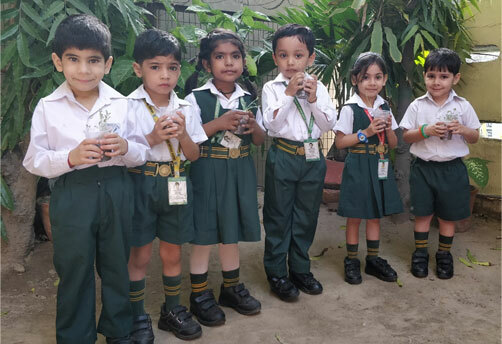 The children learnt the journey of a seed through hands on activity.Each one of them planted a seed and watered it with lot of care and watched the seed grow into a plant. 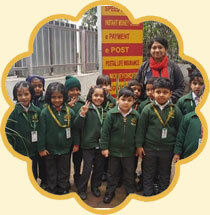 The children of Preparatory and nursery were taken to Lodhi Garden and Nehru respectively. The day was a fun filled one as they stepped outside the school to bond with their friends and teachers. A special assembly to commemorate the birth anniversary of Mahatma Gandhi was held in the school premises. Children were told about the life and work of the Father of our Nation. 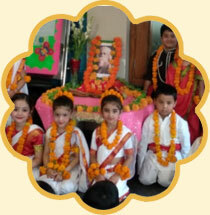 The children also sang "Raghupati Raghav Raja Ram" to pay tribute to the great leader. Dussehra was celebrated with a lot of enthusiasm and fervour. The message of victory of 'Good over evil' was passed on to the children by the enactment of a musical dance drama. Children thoroughly enjoyed the performance. They also made craft takeaways of 'Raavan'. 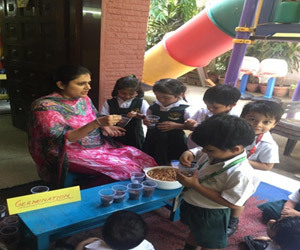 The students of nursery class studied the process of germination with hands on experience. Each student carried home a potted glass of gram seeds that had germinated after they watered their plants and took proper care. 1st to 5th October was celebrated as Nutrition week. 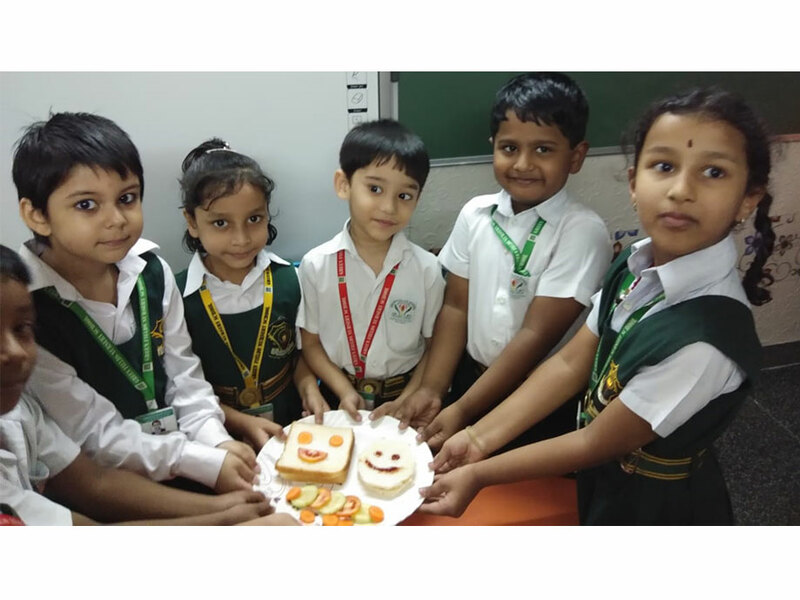 Children were asked to bring healthy and nutritious food in their tiffins like Poha/ Upma, Vegetable pulao, Vegetable sandwich and Idli, Dosa on specific days. 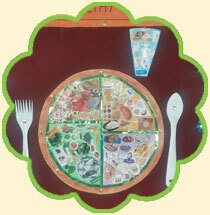 They were told the importance of eating healthy food and the perils of eating junk food through an activity of 'My Healthy Plate'. 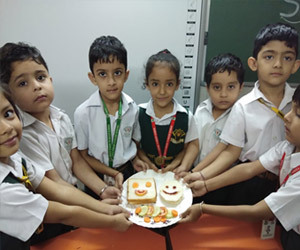 As part of non-fire cooking, Children from Prep class made vegetable sandwiches. Teachers day was celebrated on the 5th September to mark the 130th birth anniversary of Dr.S.Radhakrishnan. As a part of a special assembly, children were told about the great leader. They also sang songs to express their gratitude to the teachers who tirelessly work for their betterment. 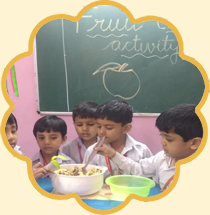 To instill healthy eating habits in the little ones, nutrition week was followed from 1st Oct -5Th Oct. Children were encouraged to bring healthy snacks specified by the school as per a diet plan which was thoroughly enjoyed by them. 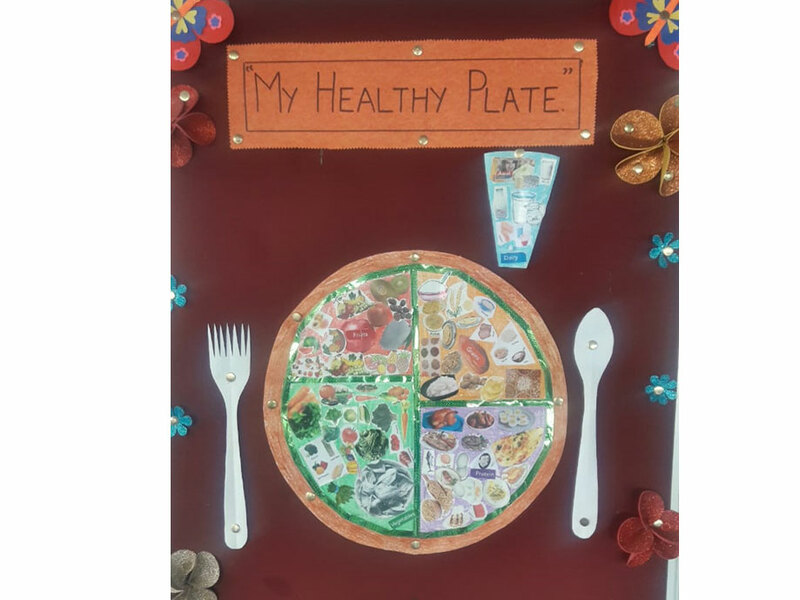 A healthy plate activity helped them learn the benefits of healthy eating. 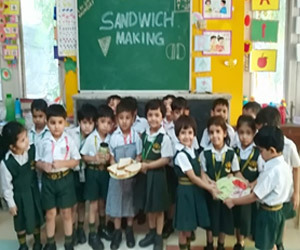 As a part of Nutrition Week, children saw demonstration of Sandwich Making. All of them relished the yummy sandwiches made for them by their teachers. Every month a couple of races are held to promote gross motor development and to promote sportsmanship qualities in the young sportsmen of our school. 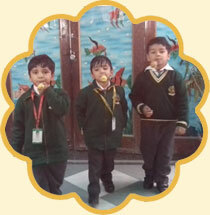 This month saw Preparatory children participate in tunnel race and the nursery children in Biscuit race. 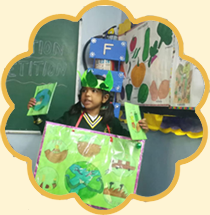 The children of Nursery learnt about the journey of a plant from a seed to a tree through an interactive and hands on activity of Germination. 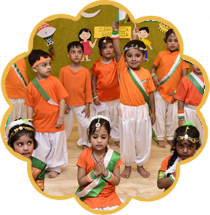 To mark the 72nd Independence Day of India children participated in a cultural extravaganza in the school premises. Mr. Anil Khanna, Director, Greenfields Nursery School, graced the occasion and hoisted the National Flag. The performances enthused patriotic fervor among one and all. They portrayed unity in diversity, our cultural heritage, the story of our freedom, an ode to the defence services amongst others. 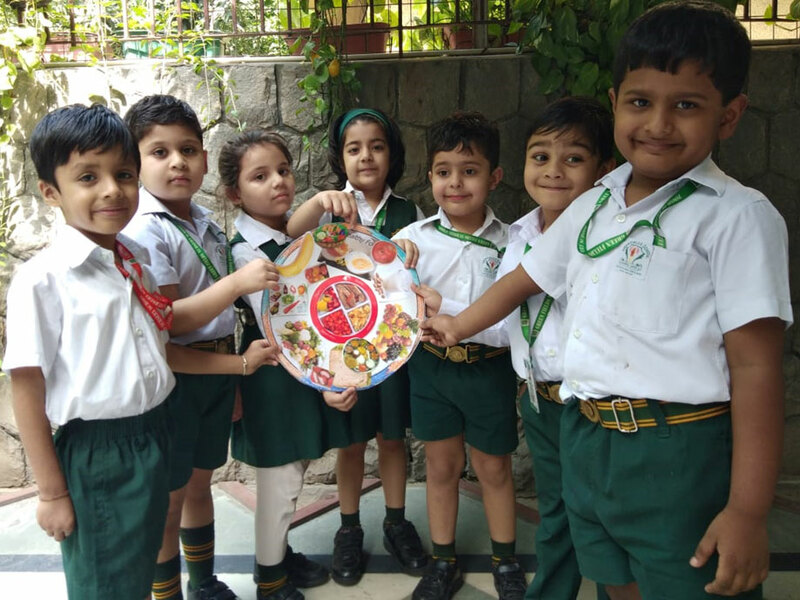 Fruits and Vegetables week was celebrated in school to tell the children about the benefits of eating fresh fruits and vegetables. 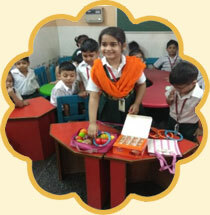 An exciting role play was conducted which enthused participation from all children. 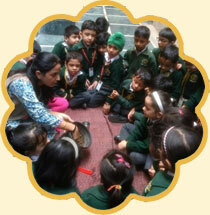 Children learnt how to make fruit chaat. They also did paper tearing and pasting in a Mango. 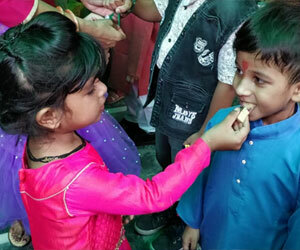 Rakshabandhan, the festival to honour the enduring bond between brother and sister was also celebrated in the school. 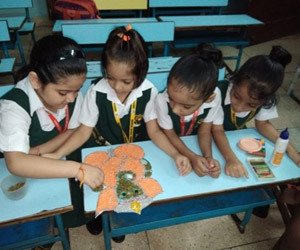 Children were told the importance of the festival after which they tied rakhis and were introduced to the customs and traditions that are followed. 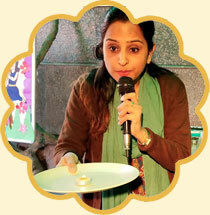 The story of the birth of Krishna, was narrated through a musical drama to celebrate the festival of Janmashthmi. 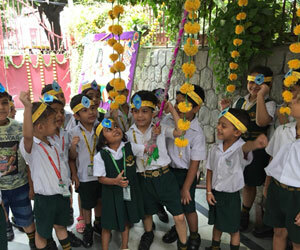 The school premises was decorated beautifully to mark the occasion. Our children, dressed as various characters from Krishnas story, made the morning come alive with their enchanting performances. Children decorated colourful ‘matkis’ and made beautiful crowns as takeaways. 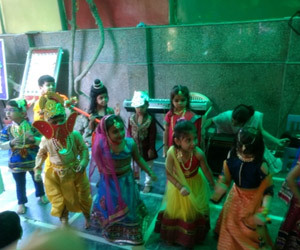 To enrich their social and emotional development, the children from Prep class visited the Jagannath Temple. This year's theme for Hindi recitation competition for Prep Class was Patriotism. 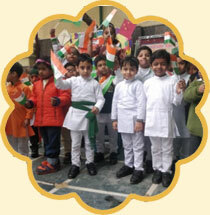 Children demonstrated an exciting level of confidence and patriotic sentiments. 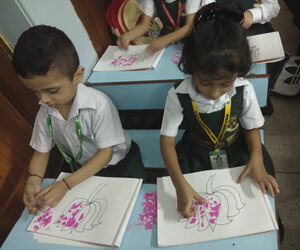 Paper tearing and pasting in Lotus was held for Prep class and Flag colouring competition was held for Nursery class. 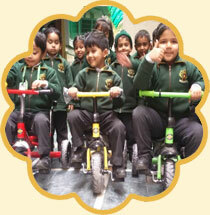 To boost gross motor skills in our little ones, a flat race was conducted for Nursery class. Cleanliness week was observed from 8.7.18 to 13.7.18. As a part of this week, Health and Hygiene Day was observed on 11.7.18 to impart values of healthy habits in the little ones. 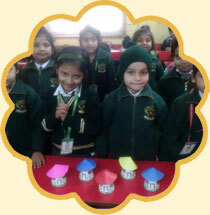 Each day "I am neatly dressed" badges were given to the children. This encouraged them to turn up well in their uniforms every day. A demonstration on healthy habits was conducted to inculcate good habits amongst the future citizens of our country. The rainy season was welcomed by the children of Green Fields Nursery School with a lot of splendor. 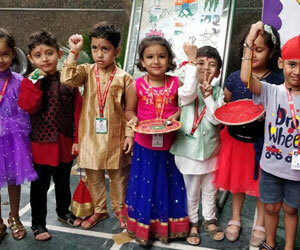 Activities included making of monsoon mobiles, making of corn chaat and an umbrella race. 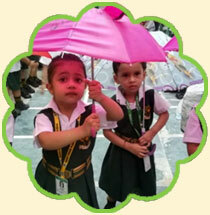 A special assembly was conducted where the tiny tots danced with umbrellas. English Recitation Competition was conducted to boost confidence in the children. The poise with which each child recited the poems left everyone spellbound. To inculcate family values and strengthen the bond between mother and child, Mother's Day was celebrated in the school premises on 8th May. The children performed with a lot of enthusiasm. Dressed in colourful ensembles the nursery children performed for the very first time at GFNS and brought a smile to everyone's faces. The nursery children made craft takeaways saying 'I LOVE YOU MOM'!, while the Preparatory children made a card for their mothers. The birth anniversary of the greatest poet of India, Sri Rabindranath Tagore was celebrated with lot of pomp and splendor in the school. 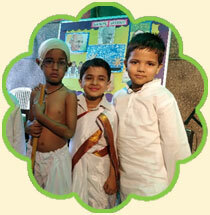 The children presented an array of programs in traditional attires. They were taught that he was a noble laureate who also wrote our national anthem. Each child is unique and special in Greenfields Nursery school. He has his individuality and his own pace and style for learning. 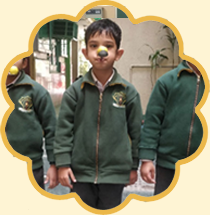 To cater to holistic development of all children, we strive to create a cohesive environment where the auditory, visual and kinesthetic learners are exposed to activities that help in making learning a fun filled experience. Activity based learning is one step towards this. The festival of Baisakhi was celebrated in the school premises on 13th April 2018. 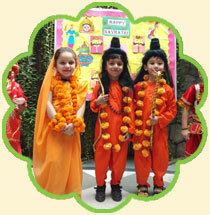 In the special assembly, the importance of the festival and its rituals was explained to the children. 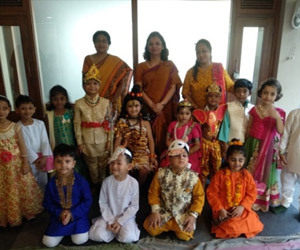 The children from Prep class presented a dance on Punjabi folk songs in traditional attire. Earth day was celebrated on 20 April. It was a great day to teach children the importance of keeping the world clean and follow green habits. Children from all sections of Preparatory and Nursery took part in the tree plantation and group activities were based on “best out of waste”. 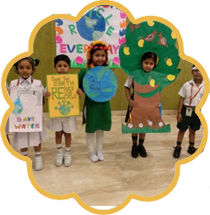 A special assembly was conducted where children spoke about measures to be undertaken to save the earth. It Was an enriching experience.